The confluence of holiday socializing, firewood-gittin’, and a New Year’s virus finally caught up with me this morning, and I came to my desk thinking it Monday and therefore as good a day as any to tuck into the sundry projects begging attention. By the time I realized the start of the work week is still a full 24 hours hence, the snow that fell overnight had turned to rain, and this bleak fact, coupled with the congealed porridge of mucous rattling my every labored breath (hope you weren’t planning on oatmeal for breakfast! ), cemented my decision to just stay put. We launched the New Year with vigor, and this was particularly impressive, considering we stayed up ’til all hours – 10:30! – at a friends’ party. I felled and skidded what I’m currently estimating to be approximately six cords worth of hardwood logs, a calculation arrived at despite my long history of firewood-related optimism and the unflattering truth that year after year after year my initial estimates prove themselves ridiculously inflated. So, yeah, in truth, there’s probably about four cords of firewood at the landing. But that’s still four cords more than were there a few days ago. While I sawed and skidded, the boys and Penny split and piled, and all in all it was a fine way to ring in the first two days of the New Year. For all the food we grow, and for the multitude of other ways in which we fill the cup of our needs from our own wellspring, putting up the fuel for a winter’s worth of fires – some for warming, some for cooking, all for pleasure – is the act that brings me the greatest sense of satisfaction and, in a way I fear I will struggle to explain, liberation. As Andrea recently reminded me, it was Edward Abbey who wrote the cliffs notes guide to overthrowing the system: Brew your own beer; kick in your Tee Vee; kill your own beef; build your own cabin and piss off the front porch whenever you bloody well feel like it. Good stuff, Ed, and not a bit of it in the wrong, but for those of us in the north country, I hasten to add one more: Put up your own damn firewood. The last post brought a few trapping related questions. First, thanks to everyone who’s recommend it, but we’ve seen Happy People. In an actual theater, even! Got in line at noon for the 7:00 p.m. show. That was a long, lonely wait, let me tell you. Second, there is very little chance of catching non-target animals in underwater sets, which is one of the reasons the boys are particularly keen on water trapping. Most crucially, there is essentially no chance of bagging someone’s pet. Third, the boys trap primarily for meat and fur and are committed to utilizing the whole animal (beaver liver pate, anyone? No? How ’bout muskrat pot pie?). They do sell a small number of furs to local craftspeople, but they are not drawn to commodity fur selling. Fourth, the conibear traps like the one pictured kill instantly. Fifth (and even though no one asked about it), supporting the boys’ trapping exploits was initially difficult for Penny and me. It was only through significant amounts of research and examination of preconceived notions that we have, over time, become accepting and even appreciative of their passion. My dad had a trap line back when there was still undeveloped land around here. I still have the lovely mink stole he had made for her, complete with little clips with beady little glass eyes. When she got dressed to go out, she was da bomb! I still can’t get over you doing all that firewood by hand. Jeepers creepers wisht I was 40 years old again. But hey, yuh duz whut yuz gotta do! Yes, well, I wish I was 40 years old again, too! I think 55 was the approximate turning point of having to seek mechanical assistance. May you stay hale (hail?) and hearty for a long long time! My younger brother would say “When I was 5…”. He would say this at 5-1/2, 6 and so on. So cute! My 3 year old said just today “When I was little I was afraid when Daddy used the chainsaw but now I’m not.” So big and brave! Sniff! I’m wondering if you have ever thought of using a horse or pony to skid your firewood out of the bush. I gave up on bulling and jamming with tractors and winches in the woods, long ago.When I lived in Vermont in the 70’s I had 2 ponies, just 42″ tall at the withers that I used to skid out 35 cord of firewood per year. I “graduated” to work horses a while later because I needed more power to bring out saw logs for my mill, but I still used the ponies for firewood, i.e. tops and trash. Nowadays I am in Nova Scotia and am using a single horse to get out logs and firewood, taking advantage of snow covered ground to make the skid easier on the horse and the ground. The other thing I am wondering, is if you have a dog. I can’t recall seeing one or reading about one in your blog. Beaver liver pate, yes please. 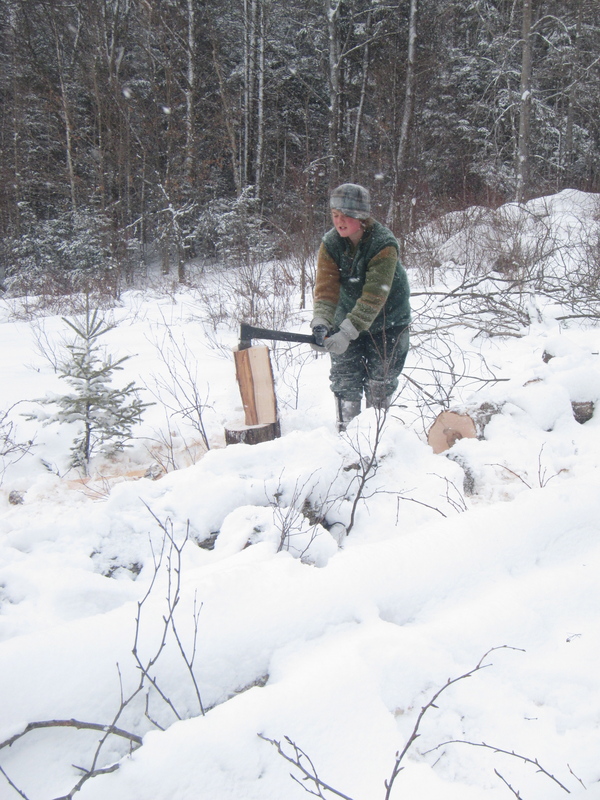 Tres Joie, my granps was splitting firewood by hand, for the whole winter well into his 70s, and on the day he died. . It’s that beaver liver pate and muskrat pies that keeps them going. You know I think that it was just my circumstance that led me to need mechanical assistance. Valley Fever did me in. It still messes me up. My Uncle Louie was up on the barn roof fixing it at age 85. So if life hadn’t thrown me this curve ball I might be up there, too. Ach! If only liver pate and muskrat could bring me back to my former glory! Glad that you shared about questioning your preconceptions even though no-one asked. Recognizing my own bias is possibly my greatest challenge as a parent/human being. Since you have made a mindful turn away from normative life, I am curious about your preconceptions about the boys’ trapping…was is trapping itself, the potential dangers/challenges, or something(s) else that you found difficult to support? Magnificent insight into the benefits of a wood fire: “some for warming, some for cooking, all for pleasure.” May your new year bring all three in abundance! I remember reading of yours and Penny’s journey toward acceptance and approval of the boys trapping passion in the past. And, it’s one of the greatest lessons I’ve taken from your writing in regards to this whole immersion learning thing. To truly follow this path, you need to be willing to really follow the lead of the child even when it is in directions which are unfamiliar or uncomfortable for you as the parent. I think of that a lot as my boys’ passions begin to become more evident and, I know, will take me in places I never thought I would go. But, that is one of the things I looked forward to the most when I became a mother. And, my soaked oatmeal will still be delicious tomorrow morning even after reading this – no worries! Hope you feel better. Hey… no need to go talking ’bout me behind my back… on MY blog, no less! Our log splitter (I love it like a brother) sits out in the side yard, covered with a tarp, surrounded by unsplit logs that I dearly wish we would have taken care of before this latest blast of cold (yesterday’s high was around 15, tomorrow’s high is supposed to be 2 degrees. So it’ll wait there for a time. Do you have any trouble burning the wood that is freshly split? We try to split ours in good enough time to allow it to dry out before burning, though I know it depends on the type of wood. I have a log splitter as well. I have a full-time job, an hour commute one-way, no help splitting, and I need about 10-12 cords per year. So splitting a rick to a rick and a half per hour is awesome, working by myself. I have had good luck this past year. Most of my wood was dead (for about a year) when it was cut in the spring/early summer, sat in a large pile of rounds, and was split a couple months before hitting the stove. (verified with a wood moisture meter: 10-15% moisture) I do only split after a few good days of sun and wind, though, admittedly this time of year that’s hard to find. After splitting, I put my wood under a lean-to on my barn. That said, I will change my procedure this year. Last year, I had a lot going on, let’s keep it at that. I want to have all my wood split and stacked under my lean-to by the middle of spring. It helps that my lean-to is south-facing and gets a lot of wind, since we’re one of the highest spots in the county. I had a good chuckle when I found an HTML email in my in box from Grit. Wood processing time of year, the best chainsaw, the best log splitter, etc. Really? I’ve heard Ben say cold time is best time to split, something about wood splitting easier. Also if I was doing it all manually having the weather near zero would be a blessing because of the personal BTUs generated while doing the work. Around here we process early. Use downed blue oak. Lucky we have a LOT. We’re done before winter. Done before winter for which season? This one or next year? In my perfect world, I’m working through winter for stuff I’ll put up for a year. I heard an old timer say, never do tree work in a month without an “R”. I do prefer to do tree work in the cold. oh, next year, for sure. I try to have everything split and stacked by 6/1. Try. We get our wood in SeptembeR, OctobeR and NovembeR. Winters are mild here in the Sacramento Valley in Cali-For-Ny-Aye. We note when a big tree limb goes down. Let it sit for a year or two. Then we process it. We don’t need that much. 4 cords will do it. Yes I know. My poor husband goes into conniption fits when it gets into the 30s. I’ve heard that it can get to 15 degrees but we’ve never seen it. I tell him, darlin’, you don’t know from winter. He is Southern California born and bred. Cowboyed in northern CA and Wyoming but only in summer. We were in Colorado visiting my sister once and it got down to 5 and he about dirtied his drawers. Yes, here the worst we get is 40’s during the day and freezing at night. Once in a blue moon some snow but it never sticks. We have winter season (i.e. rainy season) but winter? Not really! However let me tell you about summer! Days and days of over 100. And driz a bone. It’s gruelling.